DVC is an open source tool that could help with achieving code simplicity, readability and faster model development.The idea is to track files/data dependencies during model development in order to facilitate reproducibility and track data files versioning. However, DVC is a language agnostic tool and can be used with any programming language. Here we will describe how we can use DVC in R projects. Because of the specificity of the process — iterative development, it is very important to improve some coding and organizational skills. For example, instead of having one big R file with code it is better to split code in several logical files — each responsible for one small piece of work. It is smart to track history development with git tool. Writing “reusable code” is nice skill to have. Put comments in a code can make our life easier. Beside git, next step in further improvements is to try out and work with DVC. Every time when a change/commit in some of the codes and data sets is made, DVC will reproduce new results with just one bash command on a linux (or Win environment). It memorizes dependencies among files and codes so it can easily repeat all necessary steps/codes instead of us worrying about the order. We’ll take an Python example from DVC tutorial (written by Dmitry Petrov) and rewrite that code in R. With an example we’ll show how can DVC help during development and what are its possibilities. Firstly, let’s initialize git and dvc on mentioned example and run our codes for the first time. After that we will simulate some changes in the codes and see how DVC works on reproducibility. parsingxml.R — it takes xml that we downloaded from the web and creates appropriate csv file. train_model.R — with created variables we are building logistic regression (LASSO). evaluate.R — with trained model we are predicting target on test data set. AUC is final output which is used as evaluation metric. On the first site it seemed that DVC will not be compatible to work with R because of the fact that DVC is written in Python and as that needs/requires Python packages and pip package manager. Nevertheless, the tool can be used with any programming language, it is language agnostic and as such is excellent for working with R.
With code below 5 R scripts with dvc run are executed. Each script is started with some arguments — input and output file names and other parameters (seed, splitting ratio etc). It is important to use dvc run — with this command R script are entering pipeline (DAG graph). DVC memorizes this dependencies and helps us in each moment to reproduce results. "AUC for the test file is :  0.947697381983095"
Command “Dvc repro“ always re executes steps which are affected with the latest developer changes. It knows what needs to be reproduced. DVC can also work in an “multiuser environment” . Pipelines (dependency graphs) are visible to others colleagues if we are working in a team and using git as our version control tool. Data files can be shared if we set up a cloud and with dvc sync we specify which data can be shared and used for other users. In that case other users can see the shared data and reproduce results with those data and their code changes. DVC tool improves and accelerates iterative development and helps to keep track of ML processes and file dependencies in the simple form. On the R example we saw how DVC memorizes dependency graph and based on that graph re executes only jobs that are related to the latest changes. 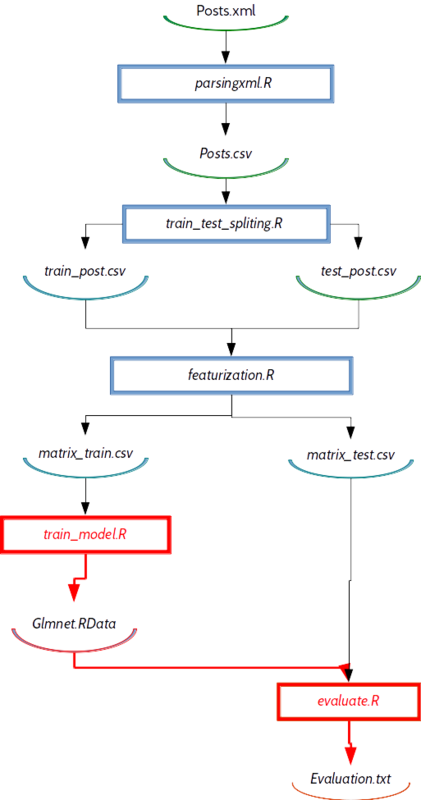 It can also work in multiuser environment where dependency graphs, codes and data can be shared among multiple users. Because it is language agnostic, DVC allows us to work with multiple programming languages within a single data science project.